1. Click on Reports in the myClub header. 2. From the list of options on the left hand side, select Members. Then select Configure under the Advanced Member option. 3. On the left hand side are the categories of database fields available to include in your report. 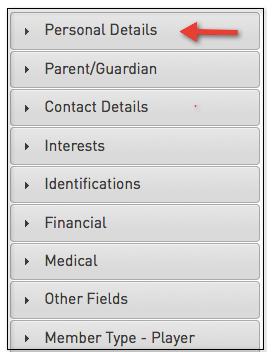 Click on one of these categories to expand the list to show all fields available within that category. Use the scroll bar to navigate up and down the list of fields. 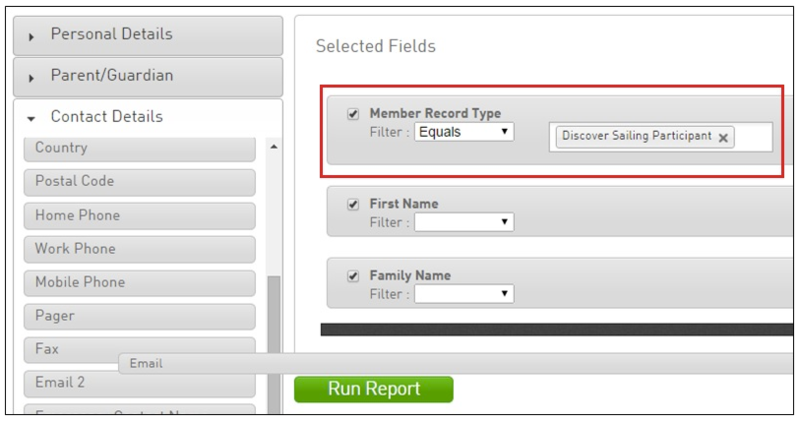 For the Member Record Type field you will need to set the filter to: Equals>Discover Sailing Participant. b). Sort by: Select a field from the drop-down list that you want to sort the report by and select the sort order – ascending or descending from the next drop down list. You can leave this field as the default. c). Secondary sort by: If you wish to apply a secondary sort, select a field from the drop-down list and select the sort order (ascending or descending) from the next drop down list. You can leave this field as the default. d). Group by: To group the data under headings, select a field from the drop-down list. For example, you could group your member data by member type. You can leave this field as the default. Display: open the report in a new screen on your Internet browser Email: email the report as a text file, suitable to be imported and modified in another program. If you wish to use this option, you must enter a valid email address into the 'Email Address' field. 6. The final option available is to save the report. This will enable you to generate this same report again in the future at the click of a button without having to go through the process of selecting and setting up all the fields and options again.